Hi, I've posted photos of some of my artwork here. I'm not a very good artist and have no training (well one semester drawing in college), but I like these efforts. From time to time, I will add new works including paintings and photographs. P.S. the originals are not for sale... unless you make an offer I can't resist! 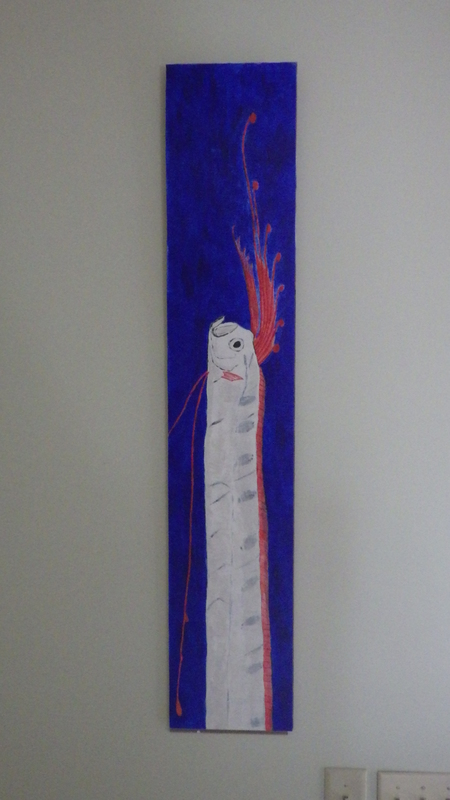 Painting of one of my favorate fishes Regalecus glesne, known as the "King of the herring" which is a type of oarfish (Family Regalecidae). The King of the Herring is the second longest fish in the world reaching a size of over 11 m (36 ft). 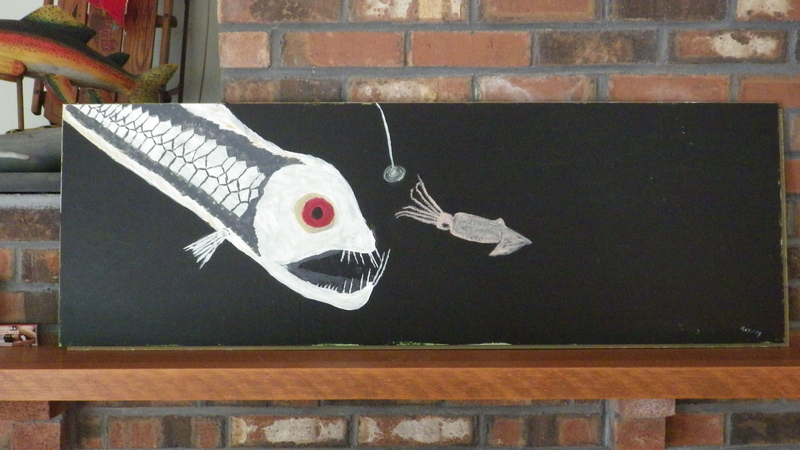 For more info on record fish sizes, see my web page at: http://www.fishecology.org/Fishfacts/fishfacts.htm Remarkably this fish swims in a vertical orientation as depected in the painting (rather like a seahorse). Its coloration is such that it is almost invisible when viewed from the side in open water. Little is known of its biology other than the fact that it is a deep water fish. 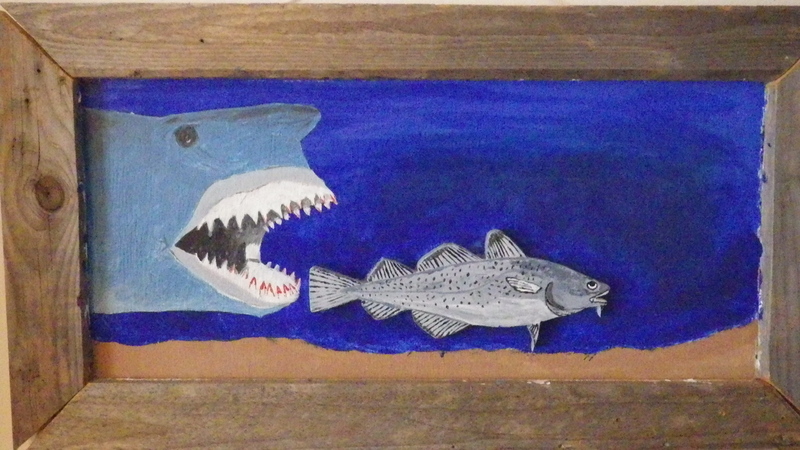 A fun painting of a shark about to eat an Atlantic cod. I painted this one for kids and had a really hard time with the jaws and teeth since I don't know how to show perspective very well. 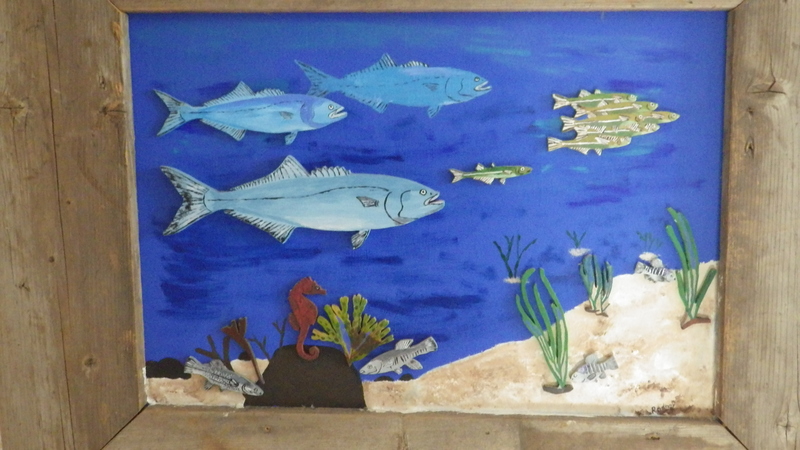 This painting depicts an underwater estuarine scene, with common fishes found in estuaries throughout the eastern United States. It was my first painting effort and it took me months to finish. Its certainly my best work, but my inability to paint perspective shows clearly in the way I did the boulders. So far the only way I've been able to get good perspective is to combine wood cuttings with the painting to get a 3-D look. 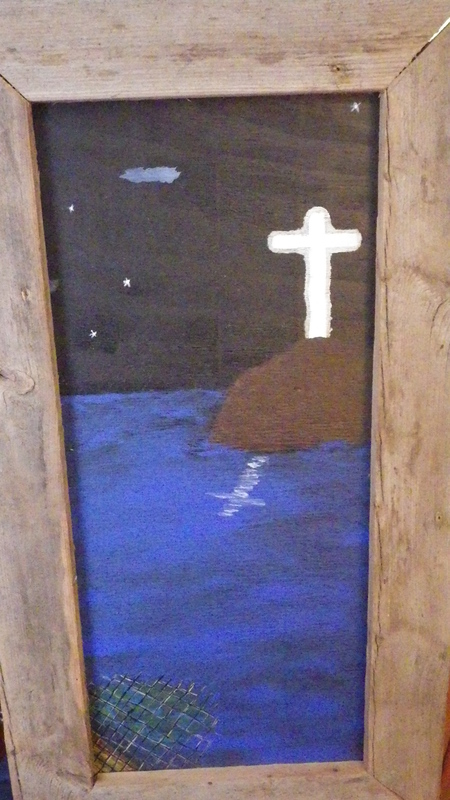 Here I attempt to paint a coastal landscape with a Christian theme inspired by the Biblical account of the future disciples casting their net according to Jesus's instructions and making a great catch, despite a long day of bad luck (John 21:6). By faith we fill our nets in life.